On the afternoon of Thursday 19 October, Councillor Jon Molyneux, Green Party, met GoBike convenor, Tricia Fort and GoBike members, Bill Fraser, who is also on Pollokshields Community Council, Bob Downie and Nick Kempe for a cycle tour of Ward 6. We were waved off from Pollokshaws Road at Shawlands Cross by Baillie Hanif Raja, Labour Party, who doesn’t cycle but wished us well. So, what did we notice apart from the information given in Andy’s notes? 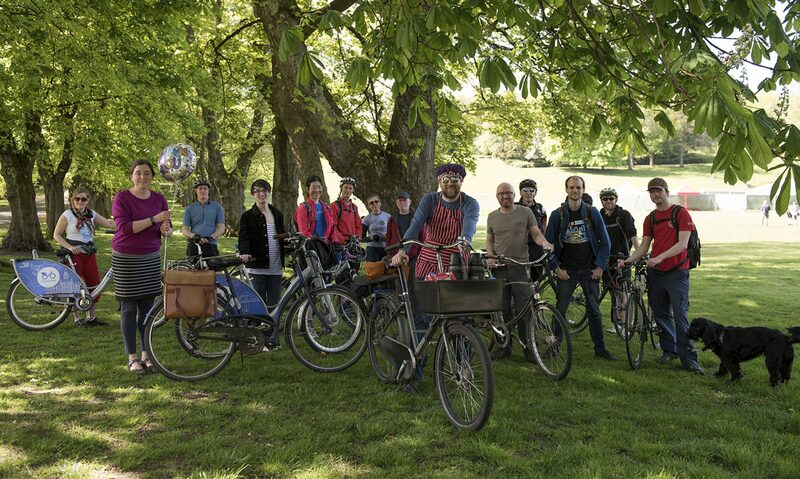 We left our meeting point on Pollokshaws Road, the most heavily cycled route in Glasgow, that has next to no cycle facilities and went along Moss-Side Road, past Shawlands Academy. There were cars parked right along, with no sign of any assistance for parents or pupils who might want to cycle to school. We made our way over the railway at Crossmyloof Station, with only an Advance Stop Line for anyone who wants to cycle to Hutchesons’ Grammar School, and down into Titwood Road. Yes, there was room to get through on our bikes, so why isn’t it signed for bikes as well as pedestrians? Where’s the permeability? At the end of Springkell Avenue, a pleasure to cycle on, we came to the path down to Dumbreck Road. Apart from the spreading vegetation over the path, there is no lighting on this path, nor on the section that goes all the way to Nithsdale Road – not a winter commuter route then! At Dumbreck Road we joined the carriageway; a tricky manoeuvre since the toucan crossing and lights seem to assume that someone on a bike will be going into Pollok Park not over the motorway towards Bellahouston Park. We checked out the exit from Bellahouston Park, thinking that quite a few families from the area might want to cycle to and from it. The only crossing over Dumbreck Road is a pedestrian one; there is no traffic signal for cars or bikes exiting the park. As the picture shows, there are no cycle facilities on NIthsdale Road, a useful route across to the east of the ward, and with 2 lanes of traffic coming towards Dumbreck Road, it’s quite a narrow access for bikes as well as cars. Later, we turned into Maxwell Drive, where cars park right over the painted cycle lanes, or are parked so close to the cycle lane that an opening door could seriously damage a bike and its rider. We made our way to Albert Drive where the Community Council has put much effort into trying to prevent cars being parked at street corners. Double yellow lines have been painted on them all, but they are not mandatory until the necessary signs are in place. The signs are not in place – what an omission by the City Council! So, one wonders, why wasn’t the bike lane continued, but with segregation, to narrow the road? Where are people on bikes supposed to go? Into the narrow roadway or on the footway? After this point the cycle lanes disappear again under parked cars. We took a left on Barrland Street to avoid the busy Pollokshaws Road but we did go to the eastern end of Maxwell Road, where there are no formal dropped kerbs to Pollokshaws Road but tarmac ramps were made for a running race a couple of years ago. Fortunately, they have not been removed. The Community Council, we heard, are working towards improving Maxwell Road by liaising with house-builders and improving the parking situation. We took a look at Forth Street, the home of Soul Riders, where recent parking changes included making the street one-way, and not exempting bikes. So, it’s either a long detour or a technically illegal ride on the footway to get to their premises. Where is the encouragement to cycle? Where is the permeability? At the new school on St Andrew’s Road, we cycled along McCulloch Street, that has been nicely traffic-calmed, and which gives much better access to Shields Road and the crossing to the South-West City Way. From this cycle way, just about the best in the city, we made the awkward right turn at West Street Subway Station to travel along all the painted cycle lanes back to Pollokshaws Road and we finished our tour alongside the cars parked on the contraflow lane linking Pollokshaws Road with Eglinton Street. The potential is there in this ward to encourage cycling, but a bit of enlightened thinking is needed to protect the existing cycle lanes and to improve access and permeability.